Early weather forecasts led us to believe we would have good conditions for the last scheduled trip of OREGON PELAGIC TOURS's first pelagic season. As the week went on, wind and wave height forecasts increased up until the day of our trip. We were able to go out, but swells were high, making conditions difficult. Despite the less than optimal conditions, we found a number of MARBLED MURRELETS just south of the Yaquina jetties. 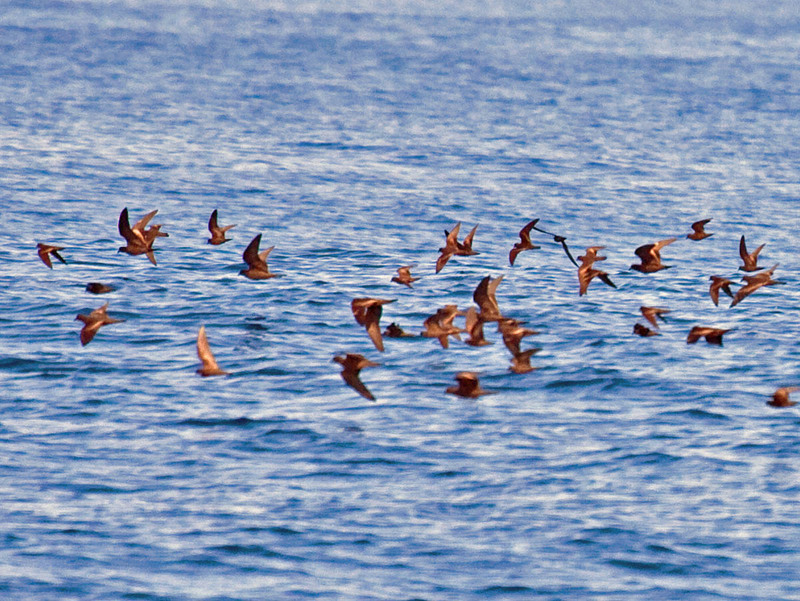 A nearby flock of feeding birds provided many SOOTY SHEARWATERS, and a pair of COMMON TERNS among other species. We headed southwest toward the north end of the Perpetua Bank and Heceta Bank complex. Along the way, we saw numerous SOOTY and PINK-FOOTED SHEARWATERS, NORTHERN FULMARS, had our best views of beautiful BULLER'S SHEARWATERS, and had some amazing views of several SOUTH POLAR SKUAS, the latter doing what skuas do best -- terrorizing other birds like PINK-FOOTED SHEARWATERS. 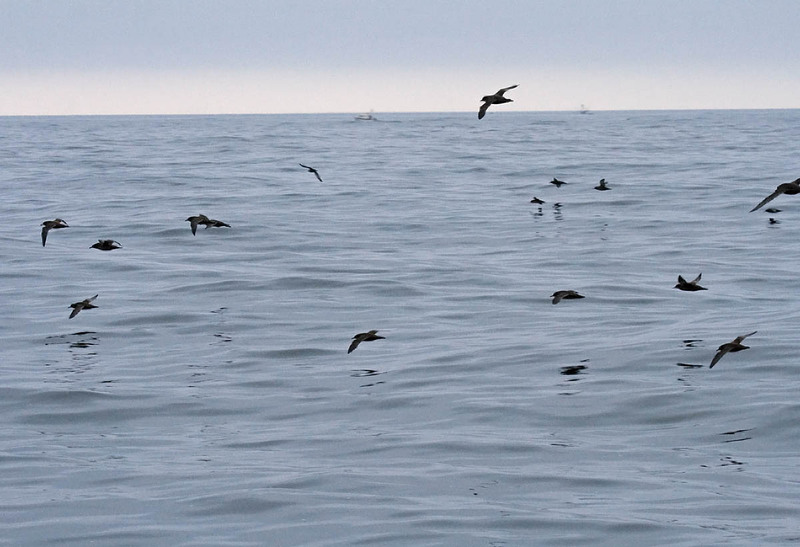 4 FLESH-FOOTED SHEARWATERS (most seen poorly or by few) was a surprisingly high number. DALL'S PORPOISE joined us on several occasions to ride the bow wave. Expected BLACK-FOOTED ALBATROSSES appeared once we got over the continental slope, as did our most common storm-petrel, FORK-TAILED STORM-PETREL. We spent time with a dragger, headed offshore for a while, then returned to a fishing trawler. 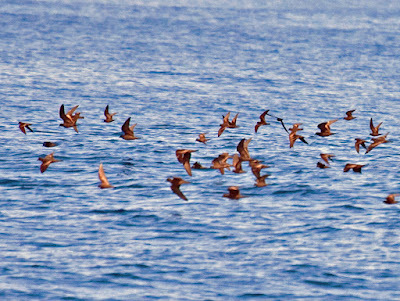 In this area among the numerous FORK-TAILED STORM-PETRELS, some observers saw two probable ASHY STORM-PETRELS, but an interesting storm-petrel with a white rump was well described by several observers as a WILSON'S STORM-PETREL (report to be submitted to the Oregon Birds Records Committee). A chum slick at a dragger brought most species close to the boat. Despite the tough ocean conditions, we had a good day. We had an incredible 20 SOUTH POLAR SKUAS, and had most of the species we would expect in October. Despite a very wet trip back to Newport, our passengers and crew enjoyed this pelagic. You prepared for your pelagic trip for months. You memorized all the subtle plumage characteristics in your field guides. 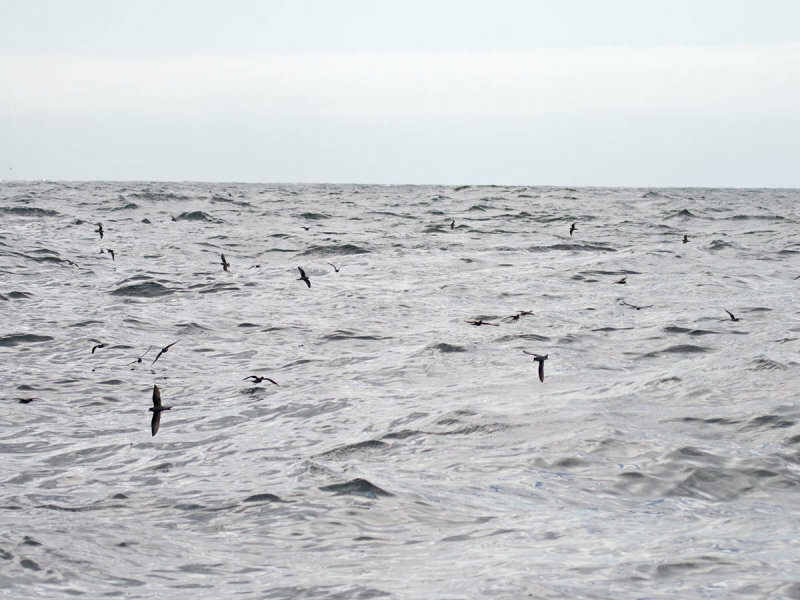 When your trip reached the point where shearwaters were swarming around the boat, you noticed something disconcerting. Even with your binoculars, the shearwaters were hard to tell apart. The boat was bouncing, the birds would disappear behind swells, they would cross over to the other side of the boat where you were looking right into the sun's glare. You just couldn't consistently make out the plumage details to make a positive identification. And yet, one of the guides, volunteering to do the messy chumming, would barely glance up from her duties--without binoculars--and confidently announce the ID of a little dot-of-a-bird over a quarter mile away! And not just once, but repeatedly! She either has inhumanly keen eyesight, or (gasp!) is NOT using the Peterson system of patternistic plumage characters for bird identification! Shearwaters fly by interspersing flapping and dynamic soaring with wings stuck stiffly out to the side. Size, structure, and species-specific flapping behavior combine with range and seasonality so that most species can be identified simply by the way they fly. As far away as you can see a shearwater flap its wings and observe its glide path, that's how far away you can identify it! You don't need to see anything else. Color and plumage patterns of the bird simply do not matter, except for a couple of "fly-a-like" pairs. 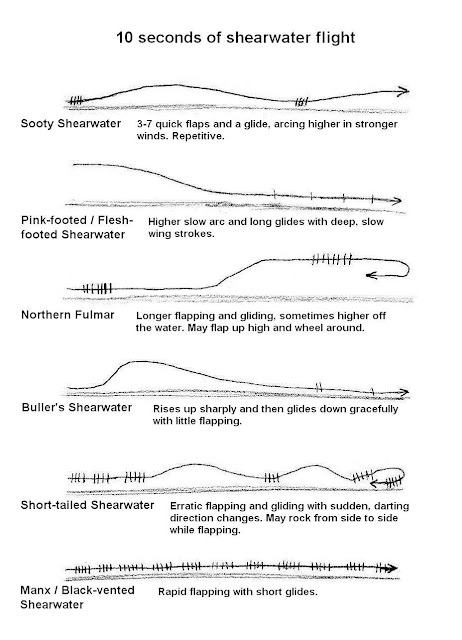 In 10 seconds (or less) you can watch the flight of a shearwater and determine its flight style pattern. On the West Coast there are 3 abundant shearwater-like birds making up most of the birds you'll see: Sooty Shearwater, Pink-footed Shearwater, and Northern Fulmar. Learn the flight patterns of these 3, and then keep a lookout for any bird that flaps and glides with a different pattern. Sooty Shearwater: Repetitive flapping and graceful gliding on narrow wings. In calm conditions normal flight is 3-7 quick shallow flaps and a sustained glide of about 4 seconds, low along the water. In higher winds there is less flapping and higher arcs, sweeping up gracefully in a banked glide, then gliding low in a wave trough before repeating with a few quick flaps low along the water and arcing up again. Sooty Shearwaters tend to glide in a straight line. Pink-footed / Flesh-footed Shearwater: The common Pink-footed Shearwater (and quite rare Flesh-footed Shearwater) is a bigger bird than Sooty Shearwater. It flies higher off the water with deep, slow wing beats ("lumbering," Stallcup 1990) and longer relaxed glides. The wings are long and broad. In moderate winds it wheels up in a slow arc above the horizon for several seconds reminiscent of an albatross. Northern Fulmar: Longer bouts of flapping and gliding than Sooty Shearwater on shorter arched wings with rapid and shallow wing strokes. Unlike most shearwaters (especially Sooty) fulmars often flap at the high point of their arcing glides. "If it flaps while up in the air it is a fulmar" is a good maxim. Another characteristic is that fulmars often wheel around and change direction while in their extended glides, unlike Sooty Shearwaters. Buller's Shearwater: They sweep up steeply and then gracefully glide downward, hardly flapping at all. Long glides on wings held forward at the wrist and accentuated by the long tail give the flight a most graceful appeal. Alternatively, groups will sometimes participate in synchronized flying with deep, slow wing strokes, flapping and gliding in unison ("languid and graceful," eNature.com 2003). Fall migrant on West Coast. Short-tailed Shearwater: Erratic flight. Often similar to Sooty Shearwater, but wing strokes more rapid and swift-like ("snappier," Stallcup 1990) usually with more flapping and less gliding and arcing. This bird often makes darting direction changes and may rock from side to side while flapping (alternately showing you its back and then belly)--both traits that separate it from Sooty Shearwater. If the flight of Sooty Shearwater is consistently repetitive and straight, the flight of Short-tailed Shearwater is more rapid, frantic, and erratic. Uncommon late fall/winter migrant on West Coast. Black-vented / Manx Shearwater: Tiny shearwater flies in a rather straight line with rapid deep wing strokes ("fluttery," eNature 2003). The glide often appears as little more than a "missed" wing beat. Black-vented is common in fall right along the California coastline. Manx is very rare anywhere on the West Coast to Alaska, also usually quite near shore. eNature.com accessed originally for unpublished manuscript of this topic in 2003. Stallcup, Richard W. "Ocean Birds of the Nearshore Pacific," 1990. Hi, everyone. I returned last night from an exciting "bucket list" cruise aboard the MS Noordam -- from Fort Lauderdale to Vancouver, B.C. via the Panama Canal. The Panama Canal is a marvel of engineering, and when you think that the engineering technology that was implemented in the early 1900's is still essentially what is in use today, you cannot help but feel amazed. 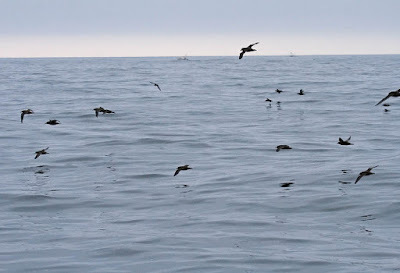 The seabirding from the ship varied from quite slow in parts of the Caribbean Sea and off Central America to large numbers of Wedge-tailed Shearwaters and boobies off of Mexico, and very exciting in high winds and rough seas off of California. Sea turtles were very common just off Acapulco, lots of green sea turtles (some being used as a raft by Black Terns) and a few leatherbacks. Favorite birds? Probably the four pterodroma petrels: one Black-capped Petrel in the Caribbean, good looks at Cook's Petrels off Mexico (with poor views off of California), great views of Murphy's Petrels off of both California and southern Oregon, and finally ( and I do mean finally), good views of three Hawaiian Petrels off California. The latter species has eluded me in ABA waters on several cruises, so I am very content to have had them last week. Lastly, one of my favorite birds seen from the boat was not a seabird at all: it was one of the three Fork-tailed Flycatchers seen on fences as we transited the Miraflores Locks in the Panama Canal. This cruise is one that I highly recommend to anyone who enjoys cruise ships.